The National Association for the Education of Young Children (NAEYC) can help parents feel good about the child care, preschool, and kindergarten programs they choose. More than 30 years ago, NAEYC created an accreditation system to improve the quality of education and care provided in programs for young children. 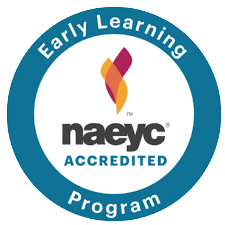 NAEYC Accreditation has become the mark of quality, helping parents find the best possible early childhood experience. Ever since 1999 the school has been accredited by the NAEYC, and in 2016 the preschool has gone through the re-evaluation process and successfully been granted the class-worthy recognition through November 1, 2021.